Yesterday, I shared a recipe for Green Garlic and Chive Pesto, now today I give you a recipe for how we used it in a pasta dish. This was one of those dishes we made up on the fly. We knew we were going to turn the pesto in to a cream sauce but, the question then was what else to put in it. I wanted to use some of the sugar snap peas that have been so good at the farmers market lately. I thought the sweetness would be good against the zing of the pesto. We thought bacon would be the perfect addition of saltiness (ok, when don't we think bacon is the perfect addition?). Since we were eating at Corner Table it only made sense to pick up some Hickory Smoked Bacon from their deli case. I usually use the term comfort food for fall and winter dishes but, this pasta is totally spring comfort food. We had worked all day around the house and yard plus, canned two batches of jam so, this pasta was the perfect dinner. It comes together quickly, the sauce is done in the time it takes to boil the pasta, and its got that creamy goodness that is always soothing. While the pasta is cooking, cook the bacon in a skillet over medium heat until crispy. Remove to a paper towel, leaving about 1 tablespoon of bacon fat in the pan. Turn the heat up to medium-high. Add the peas and cook for one minute. Sprinkle the flour over the peas and stir while cooking for another minutes. Add the half and half and bring to a boil while stirring until the sauce is slightly thickened, about 1 minute. Stir in the pesto, cheese and a few grinds of fresh pepper. Cook until the cheese is melted. Stir in the cooked bacon. Taste for seasoning and add salt if needed. Stir in drained pasta and heat until cooked through. Oh nice! Another creamy pasta dish and the pesto sounds amazing. Have a great weekend! I entered your blog and thought I went to heaven! Pasta, peas, bacon, and GARLIC! It seems I can never get enough recipes that use garlic. Thank you! I LOVE the addition of the sugar snap peas! How clever! That is one tasty use of the pesto. 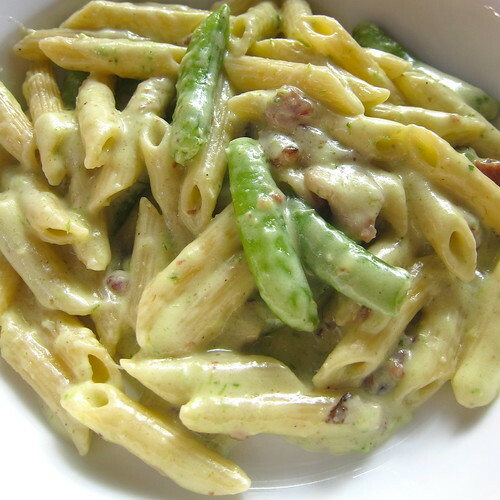 Looks like a great, creamy sauce for pasta and a perfect match for the peas. another random combination, another winner, as far as i'm concerned. this is a great spring dish, kat! Anonymous - Half & half is something we get in the stores here in the states. It is half milk and half cream so it is easy to make your own if it isn't available in stores. So for 1 cup half and half use 1/2 c cream and 1/2 c milk.